For one man, the past will never stay buried. Ian Quinn has spent his life protecting children from the monsters that live among us. As a Child Protection Officer, Ian places their lives above his own, and has no qualms about getting his hands dirty when it comes to protecting those who can't protect themselves. Years ago, Ian was unable to protect his own daughter when she was killed, and has channeled the anger and sadness into his vocation. Ian has tried to bury his past. But the past is far from done with him. The first is a key. The second is a deed to his grandfather's old butcher shop. "Sorry for everything, son, but it's your burden now." 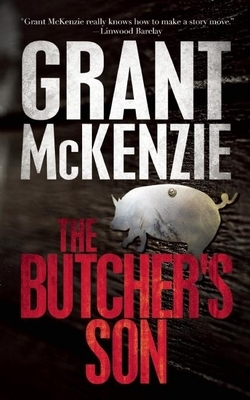 Grant McKenzie is the internationally published author of five edge-of-your-seat thrillers, plus an ongoing mystery series set in San Francisco. His riveting thrillers Speak the Dead, The Fear in Her Eyes, Switch, and K.A.R.M.A. are available from Polis Books. Under the pen name M. C. Grant he writes the Dixie Flynn series that began with Angel With a Bullet, continued with Devil With a Gun, and returns with Baby With a Bomb. His short story "Underbelly" appeared in the First Thrills anthology edited by Lee Child from Tor/Forge. As a journalist, Grant has worked in virtually every area of the newspaper business, from the late-night "Dead Body Beat" at a feisty daily tabloid to senior copy/design editor at two of Canada's largest broadsheets and editor in chief of Monday magazine. He lives in Victoria, British Columbia.